I can’t work peacefully without knowing that my hard disk is protected from shocks that might happen either with or without purpose. For me, this indicator is more to disaster rather than feature. Even without this indicator, I got enough distraction from the social medias and chat clients. So let’s remove this useless feature to help us focus. Since my Thinkpad X61 is getting old, the cooling performance is getting worse over time. Especially in last summer, everytime I played game it shuts down suddenly because of processor overheating. 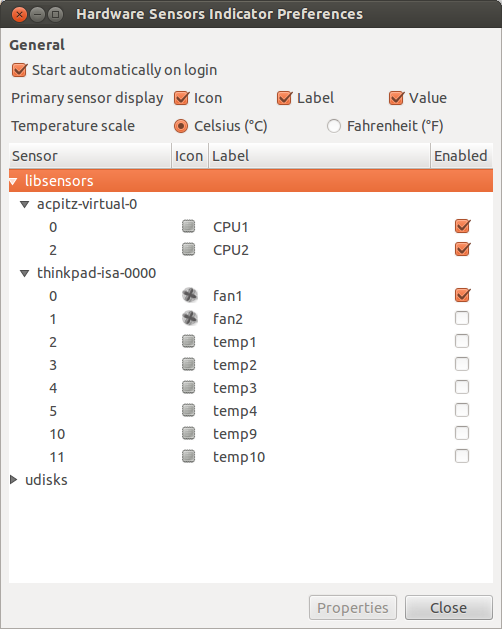 I built myself a laptop cooler out of junks, and to monitor the temperature I need an applet or in Ubuntu Unity’s term: “indicator”. There are not much option for hardware sensor monitor that gives temperature display. One of them is Psensor which is available in Synaptic. It gives one nice thermometer button on the indicator panel, when you click on it a drop down will show up with all the temperature readings. It also has a temperature alarm feature that will give notification if the temperature reaches certain value. But it’s not handy enough for me because I have to click on it to see the temperature. Neat huh? But I still haven’t figured out how to display more than one sensor reading. Make sure you put a tick on the sensors you want to activate on the applet. Ubuntu developer decides to display my name on the top right of the screen. Well, I know my name and I don’t really need a reminder. And since my laptop screen is quite small, the presence of this indicator makes it a bit cluttered. 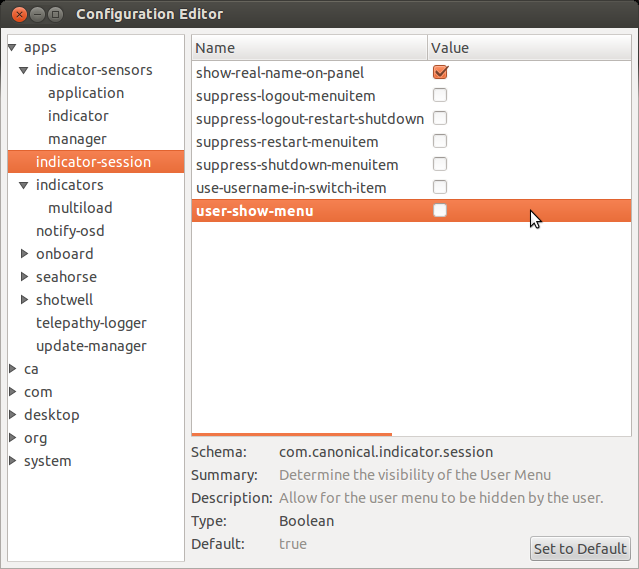 Then open dconf-editor, on the left panel navigate to “apps” -> “indicator-session”, then on the right panel remove the tick on “user-show-menu”. Close it, log out and log back in. 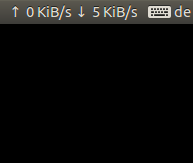 Back in Gnome2 when I was using Ubuntu 10.04 LTS, one of the applets I use the most is the Netspeed Applet. I don’t know why but I really enjoy looking at my fast network speed. But unfortunately this applet is not available for Ubuntu 12.04 Precise Pangolin user. And there are no other similar applet either, that could be installed easily. Luckily, Andrew from webupd8.org came up with solution. It uses the indicator-sysmonitor and combine it with a BASH script. Click here to go to his page and follow all the steps.